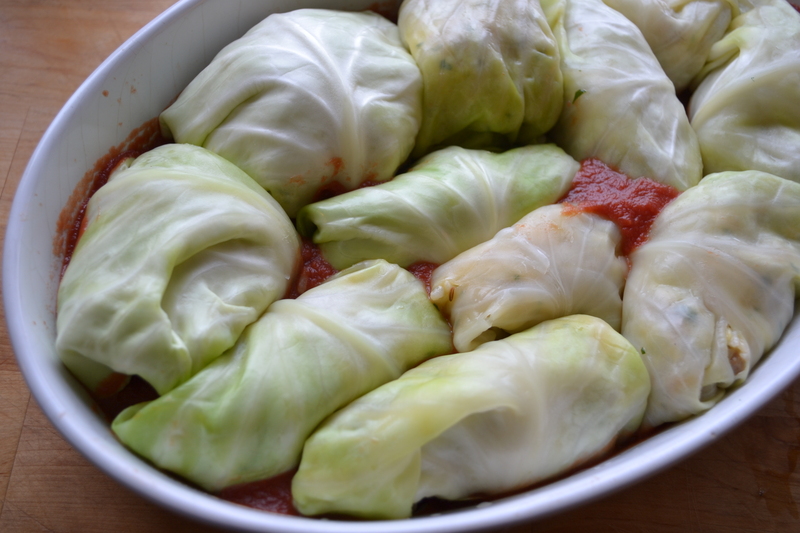 When I think cabbage rolls, sadly, I think of overcooked, limp packets of ground beef and rice in a slightly sour sauce. Usually the most redeeming feature is the sour cream on top. Time for a reinvention! And why not? As much as there is a time and place for traditional recipes, there is also room for improvement, re-thinking and re-design. I’m a big fan of cabbage. 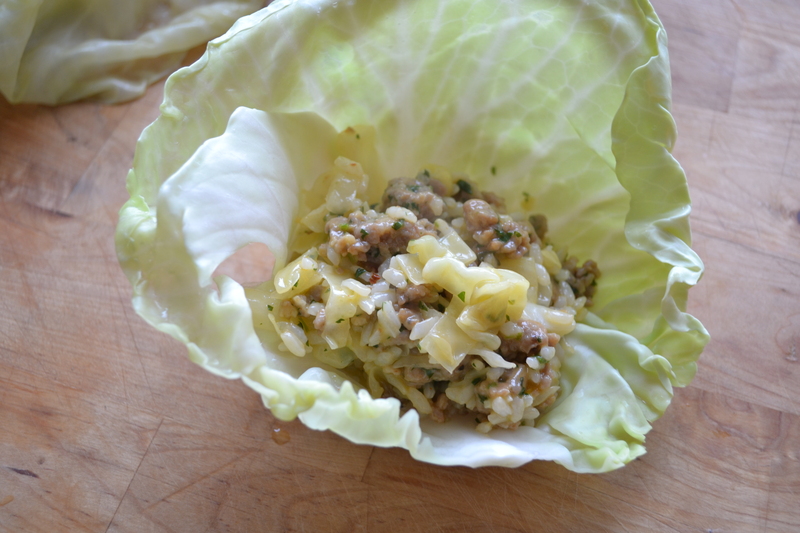 When making cabbage rolls I wanted the recipe to be as much about the cabbage as the filling. I also didn’t want them to be heavy, sodden wads. I wanted them to be fresh and appealing, not bland or cooked to death. Step one was to eliminate the rice. Have it on the side! Step two was to better match the insides with the outside. 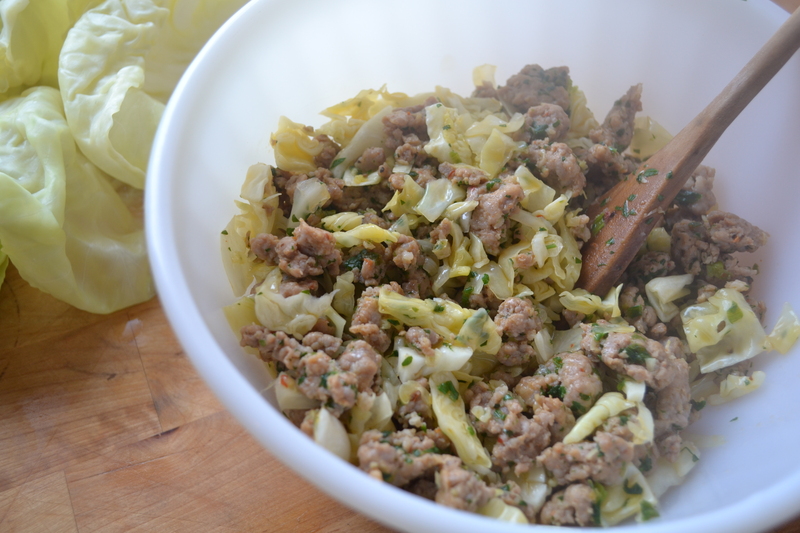 The center of these cabbage rolls are flavourful and bright because they have delicious hot sausage and shredded cabbage in them. These 2 main ingredients are kept lively and vibrant with a solid dose of parsley and green onion as well as the fuller, more savory notes of garlic and Parmesan cheese. 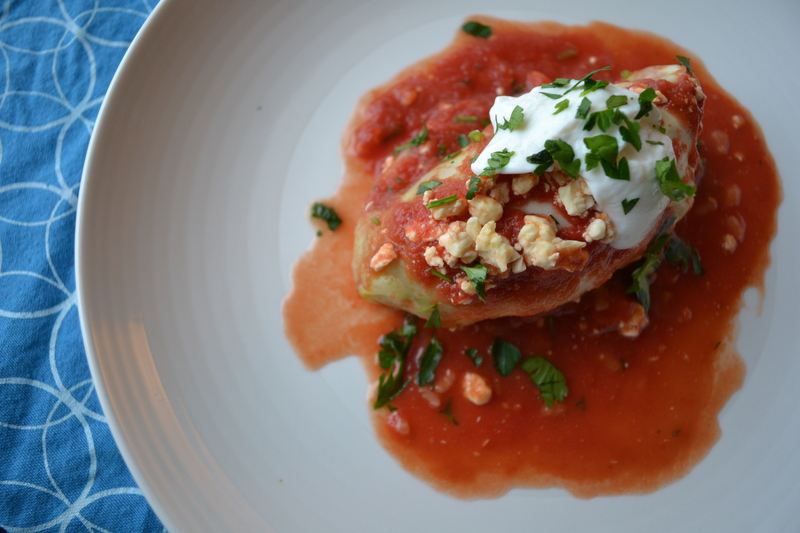 Whether or not you already love cabbage rolls, try out this recipe. It’s fun to make, easy to eat and feeds a crowd. 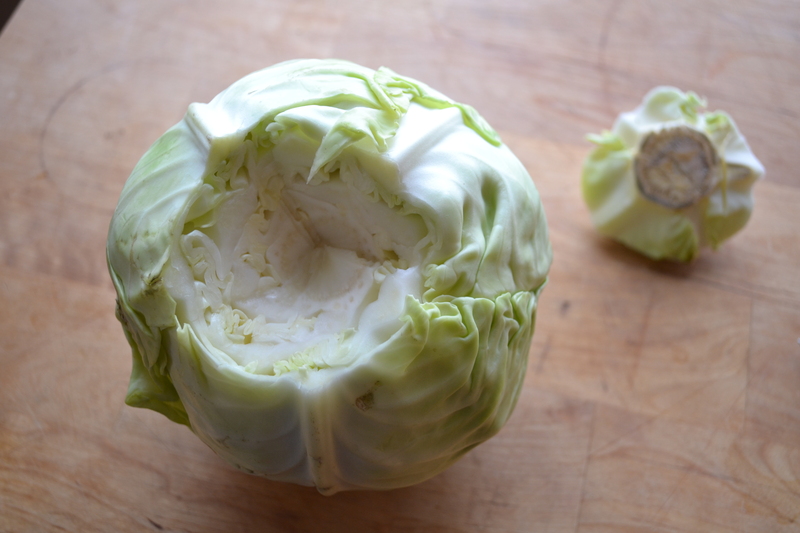 Prepare the cabbage by cutting out the core and dunking into boiling salted water (enough to cover the whole cabbage head) for about 4 minutes. Remove carefully, allowing to drain, and peel off the outermost leaves – they will be softened by the brief cooking. Trim the thick vein at the back (convex side) of the leaves. 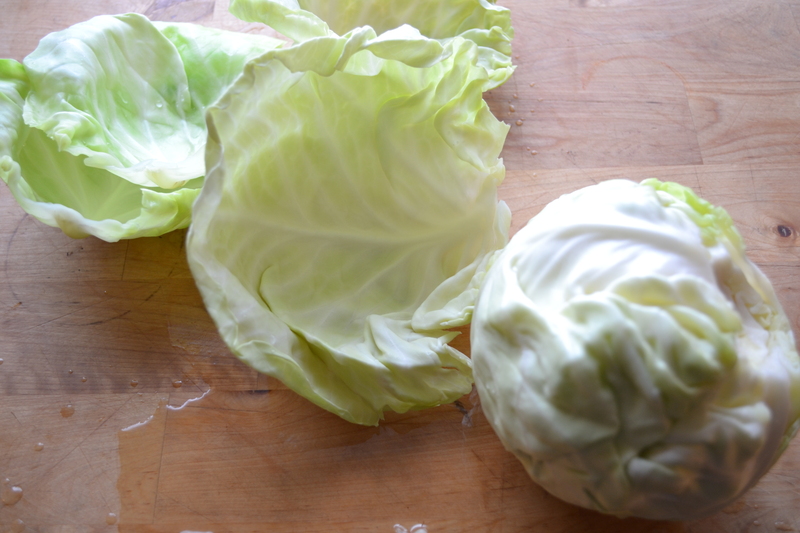 Once you have taken all the leaves you can without tearing them, return the cabbage head to the boiling water for another 4-5 minutes and repeat the leaf removal and trimming process. Repeat until you have 10-12 fully intact leaves (small tears are fine). 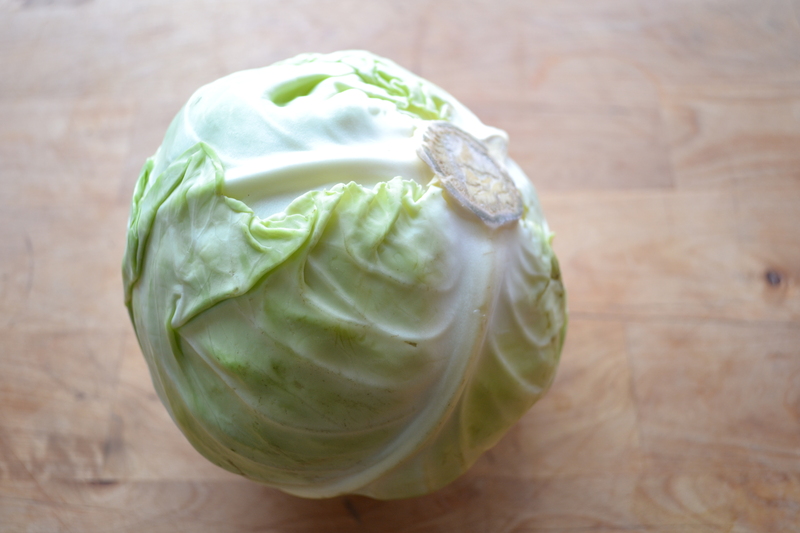 Finely shred or slice the remaining heart of the cabbage (this will yield you approximately 2 cups of cabbage) for use in the filling. To make the filling, saute the sausage meat until browned over medium heat, breaking it up into smaller pieces. Add the garlic and green onions, cook until fragrant, then add the cabbage, cooking for about 5-7 minutes longer until the cabbage softens. Remove from the heat and stir in the Parmesan cheese, check for seasoning, add salt and pepper as needed. Allow the mix to cool slightly, add the beaten egg and stir well. Scoop the filling into the cabbage leaf cups, aiming for a fairly equal amount in each leaf. 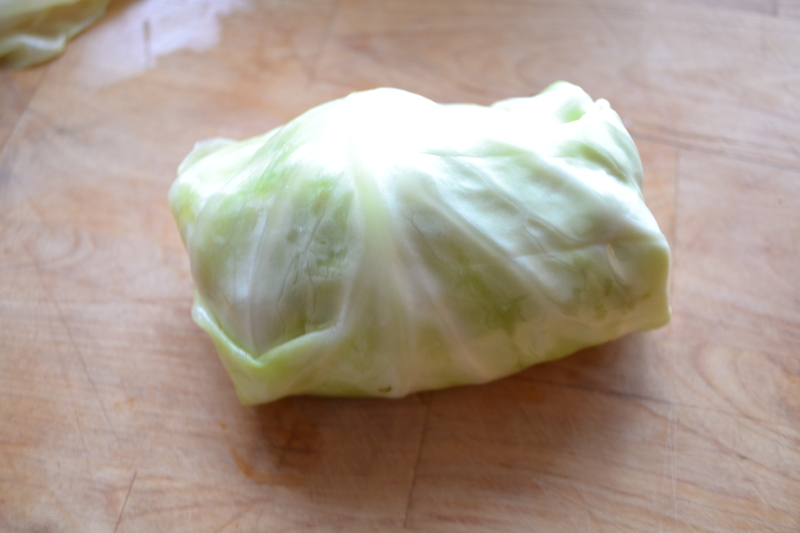 Starting with the end of the leaf that attached to the core of the cabbage, roll and tuck the filling, folding the sides of the leaf inward using much the same motion as if you were rolling a burrito or salad wrap. Repeat with remaining leaves and filling, packing the rolls tightly into a shallow casserole dish prepared with 3/4 of a cup of tomato sauce in the bottom. 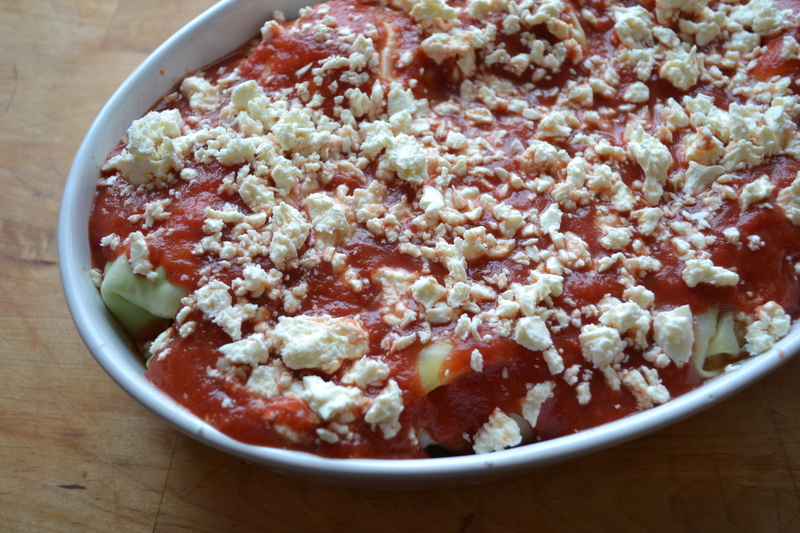 Smother the rolls with the remaining 1-1/4 cups of tomato sauce and crumble the feta over top. Bake for 40 minutes until the sauce has thickened slightly and it’s hot and bubbling around the cabbage rolls. Serve hot with sour cream and a garnish of more chopped parsley. excellent along side rice or boiled potatoes. Enjoy!